A revelatory examination of the alchemy of successful selling and its essential role in just about every aspect of human experience. When Philip Delves Broughton went to Harvard Business School, an experience he wrote about in his "New York Times "bestseller "Ahead of the Curve," he was baffled to find that sales was not on the curriculum. Why not, he wondered? Sales plays a part in everything we do not just in clinching a deal but in convincing people of an argument, getting a job, attracting a mate, or getting a child to eat his broccoli. Well, he thought; he d just have to assemble his own master class in the art of selling. And so he did, setting out on a remarkable pilgrimage to find the world's great wizards of sales. Great selling is an art that demands creativity, mindfulness, selflessness, and resilience; but anyone who says you can become a great salesperson in 15 minutes is either a charlatan or a fool. The more Delves Broughton traveled and listened, the more he found a wealth of applicable insight. In Morocco, he found the master rug merchant who thrives in Kasbah by using age-old principles to read his customers. In Tampa, he met with Tony Sullivan, king of the infomercial, and learned the importance of creating a good narrative to selling effectively. In a sold-out seminar with sales guru Jeffrey Gitomer, he uncovered the ways successful selling approaches religion, inspiring faith and even a sense of duty in customers. From celebrity art dealer Larry Gagosian to the most successful saleswoman in Japan, Broughton tracked down anyone who would help him understand what it took to achieve greatness in sales. Though sales is the engine of commerce and industry more Americans work in sales than in manufacturing, marketing, or finance it remains shrouded in myth. 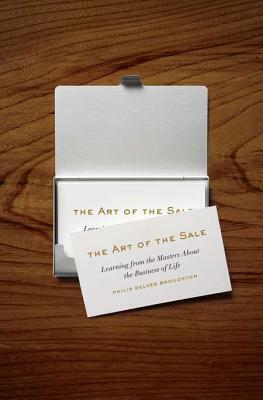 "The Art of the Sale" is a powerful beam of light onto the field, a wise and winning tour of the best in show of this endeavor which is nothing less than the means by which all of us, one way or another, get our way in the world. Philip Delves Broughton was born in Bangladesh and grew up in England. From 1998-2004, he served successively as the New York and Paris bureau chief for "The Daily Telegraph of London" and reported widely from North and South America, Europe and Africa. He led the "Telegraph s" coverage of the 9/11 attacks on New York and his reporting has twice been nominated for the British Press Awards. His work has also appeared in the "Financial Times," the "Wall Street Journal," the "Times of London," and the "Spectator." In 2006, he received his MBA from Harvard Business School. He currently lives in New York with his wife and two sons."